A man holds a traffic cone in a crowd of protestors. Protesters passing through the University of Maryland Baltimore as they head to City Hall. 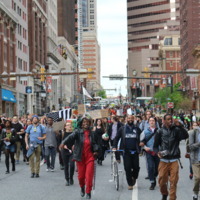 They started marching midday Saturday from Sandtown in West Baltimore. Downtown traffic comes to a halt as a diverse group of marchers protest down St. Paul/ Light Street.